He may be your neighbor, a friend, your boss’s son, or even a close relative. Virtually everyone either knows someone who has been a Mormon missionary or has had their own experience with a pair of zealous young men in their trademark white shirts and ties. Some 50,000 young 19-year-olds are signed up for two years of missionary service for The Church of Jesus Christ of Latter-day Saints at any given time. These Mormon missionaries are then sent throughout the world with instructions to spread the Mormon word and offer a variety of practical services as driven by local needs. These soldiers in “God’s Mormon Army” are seen on bicycles, in public gathering places, and sometimes at your front door. Who are they? Where do they come from? What is it that they do while serving “Two years in God’s Mormon Army”? This is the story of one typical missionary who served in Thailand during the 1973 Thai Revolution, while other Southeast Asian governments were all collapsing, following the U.S. withdrawal from the Vietnam conflict. 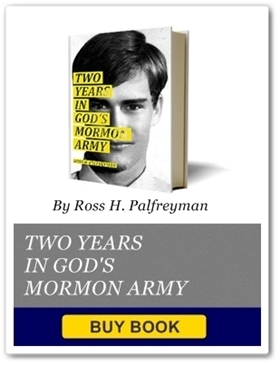 With this political turmoil as a backdrop, the author follows his day-to-day missionary life, from the extremes of being threatened at gun point to the routine attempts to convince culturally, nationalistically and religiously bound Buddhists that their lives would be better off in this world and the next if they embraced Christianity as taught by the Mormons. This missionary experience is deepened and enriched by battles with parasites, broken ankles, rabid dogs, bicycle accidents, religious intolerance, and the foibles of youth. Through it all, a Mormon mission can be the single most adventurous and influential event of a young man’s life. It is a process that is clearly worth living, whether in the first person or vicariously through the chapters of this book.